Our reefing furling system uses a return halyard, eliminating the possibility of jamming, sticking or becoming tangled at the top of the mast. RETURN HALYARD: The sail is hoisted to the top of the furling by means of an external halyard that is fed from the "block" (pictured). This block is fabricated into the top of the furling extrusion and the halyard returns to the drum where it is tied off. The sail is then tensioned by down hauling to the drum. 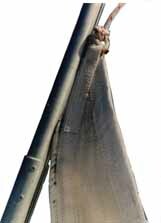 FURLING SAILS: The sail should have an 8mm (5/16') bolt rope of hard nylon or similar in an envelope on the luff of the sail and should end as close to the top corner (head) as possible. The bolt rope should be stitched into the top 3 or 4 inches of the bolt rope envelope and not be stitched at the bottom(tack). The bolt rope should extend several inches beyond the end of the envelope. This prevents the sail gathering on the bolt rope. The furling sail can have straps at the 'head' and 'tack' (as indicated) instead of the usual 'eye'. The UV protection is usually applied to the Starboard side of the sail. THE BOLT ROPE: The bolt rope should be 8mm (5/16') and can be of hard nylon, polypropylene polyester or similar. The photo is of Polyethylene Staple Rope (SILVER) and is ideally suited as a bolt rope. There is no need to replace your existing sail. All sails can be converted to a furling sail and conversion is usually simple and inexpensive. We will supply the exact sail luff measurements with your order. There is no problem if your sail is short, however if it is too long, your sailmaker will be able to 'trim' the sail to fit your new system with minimal sail area loss. Do not be confused with sail conversions, we would be pleased to assist you or discuss your individual requirements.